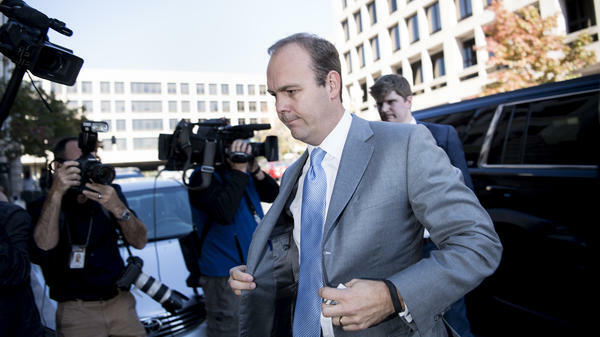 Gates previously pleaded guilty to conspiracy and making false statements. He is cooperating with prosecutors. Paul Manafort's longtime deputy, Rick Gates, testifies in his federal trial on Monday in Virginia. Gates told jurors that he and Manafort had broken the law together. Gates pleaded guilty earlier this year as part of an agreement to cooperate with federal prosecutors. "Did you commit crimes with Mr. Manafort?" prosecutor Greg Andres asked soon after Gates took the stand and described his relationship with Manafort. Manafort's former bookkeeper and tax accountants have testified that they dealt with Gates in preparing Manafort's financial paperwork. Prosecutors are looking to him for an insider's account of what they say was a scheme by Manafort to use offshore bank accounts, shell companies and wire transfers to avoid paying taxes on tens of millions of dollars of unreported income. Gates said he knowingly provided false and doctored documents to banks and also said that at "Manafort's request," the two men knowingly kept the fact that Manafort had foreign bank accounts from the IRS. But Manafort's legal team is expected to use Gates, too. In his opening statement last week, defense attorney Thomas Zehnle accused Gates of embezzling money from Manafort's consulting firm. On the witness stand Monday, Gates confirmed that he stole from Manafort. He admitted to embezzling "hundreds of thousands" of dollars from Manafort's firm by filing fake expense reports. Juries are typically skeptical of witnesses who enter into agreements with prosecutors, said Sam Buell, a former federal prosecutor and a white-collar-law expert at Duke Law School, so he said he was not surprised by the defense's strategy of going after Gates. Gates has already admitted to lying to investigators once. Buell also said it's very difficult to find a strategy for defending against fraud charges in cases with an extensive paper trail. Manafort's has included a large amount of such evidence. Gates said Monday that he turned over "document, emails, computers, and phones" to prosecutors. When that's the case, "You've got to try to find a way to throw a monkey wrench in," Buell said. Prosecutors have been preparing for this credibility battle by asking a number of witnesses to speak to Manafort's role as a supervisor over Gates. When asked who was in charge in the relationship, Manafort's longtime tax accountant Phillip Ayliff told the jury: "Oh, Mr. Manafort." Gates, in his testimony, said he first met Manafort at a Christmas party at Manafort's house when Gates was an intern in the 1990s. He added that Manafort was "probably one of the most politically brilliant strategists I've ever worked with." Throughout the testimony, Manafort was looking at Gates, but Gates kept his eyes on the jury, judge and the prosecutor questioning him. Gates is expected to take the stand again on Tuesday morning for more questioning from prosecutors, and the defense's cross-examination is expected to take up most of the afternoon.